The Jefferson State Militia - THE REPUBLIC IS DEAD; WE ARE READY TO FIGHT, NOW WHAT? Most of us have been in this tragic position before. It feels something like that slow, heavy walk that we experience as we approach the front door of the funeral home. The anticipation of walking through that door into a room that reeks of death is a soul chilling moment that is never forgotten. The statements, the warnings, the what if’s, and how can they do that situations are thousands upon thousands across America. The personal injuries heaped on the heads of true Americans at the border, in the city streets, by apostate church leaders, from judges at all levels, to the arrogant bureaucrats that run our lives and could fill the Library of Congress if printed, are ABSOLUTE proof that the Republic is dead. There is no one left to turn to for relief from an onslaught that would have been a declared war had it come from another country. We as a nation of citizens, have been brutalized so badly by criminals inside the government, that we could have easily justified the use of deadly force to beat back the pillaging of our homes and communities. And diabolically, this has been done by the very people who were allowed a seat of power over us by our own vote. The ongoing war for liberty is being waged on a thousand fronts. City and county governments have been persuaded by government agents to buy into Agenda 21 at all levels and adopt the radical environmentalist agenda. These local maniacs have done so eagerly. They revel in the appearance of solidarity both socially and politically with those who want to see swamp dwelling muskrats be able to retain attorneys should their habitat be threatened. Utterly blind deceit and a spirit of delusion reigns. Churches and cities have joined in efforts to provide illegal aliens (illegal here meaning ILLEGAL) “sanctuary” in direct and open violation of federal law. You know, the kind of federal law that says you can’t shoot FBI agents on sight or that you MUST pay a voluntary illegal federal income tax, or call a sodomite evil, to just name a few minor federal laws. But then, since when has consistency or lawful conduct ever meant anything to BATF, FBI, IRS, CIA, DEA or NTSB agents that were at Ruby Ridge, Waco, Oklahoma City, Flight 800, New York, the Pentagon, Dallas, etc., etc., etc…..We have been misled, lied to, confused, plotted against and abused by lawyers representing all of these entities so many times, that every last one of the perpetrators would have been hung in the public square 120 years ago. My dear God, how is it possible that the Attorney General’s office is staffed by radicals and rights robbers? How is it that Eric Holder, a radical political leftist shames us daily by walking into his office? Add to that a supremely incompetent Janet Napolitano, racist Planned Parenthood supporter Sebelius, bumbling Biden and on and on and on. So instead of moral leadership in the states, we must endure examples of freedom’s guardians like the State of Missouri and the “bumper sticker” warriors with the Missouri State Highway Patrol. We watch helplessly as Arizona is set upon by jackals from Mexico and California slips into the ocean of poverty and liberalism run amok. All in the name of progressive socialism, or “do whatever you want and get someone else to pay for it” statism. 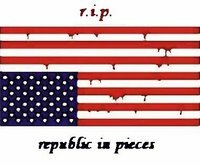 The Republic died because we were not content with freedom in every corner of the land. No, we allowed our legislators at all levels to create “freedom” out of nonsense and liberty out of lawlessness. We shook our heads when the courts made law from guilt, incarcerated the innocent, and set the criminals free. We are living with Alice in the 180 degree world of Wonderland. Bad has become good, right has become wrong and gray the color of choice. Now comes the hard part. There are no easy paths left for America or Americans. Any last second victory with a miracle field goal is just not there to be found. We left the playoffs in second place. Doesn’t matter that they cheated and the refs were bought off, it is in the books as a loss. Get that fact firmly planted in your minds. This game is OVER! You may continue to live in your comfort zone and deny all truth. Some of you do and justify it because you don’t want to rock anybody’s boat. A few of you write to me, lie about the facts and tell me I am the nut job. Hear me well. I do not want to rock boats, I want to sink fleets!! That time is now. If they wanted me to go to Viet Nam and fight someone else’s civil war, then I am just as ready to fight one right here and right now. They have sent our military to prove freedom and “democracy” are worth fighting for. Well, how about doing the same in America? Let’s put those troops on our own borders, PLEASE!! Let’s sink the coastal pirates and the drug runner’s boats with chain guns and A-10’s. Throw some ordinance in those border tunnels. Yea, sure. But we WILL kill women and children at Waco and Ruby Ridge now won’t we, and call it righteous. Janet “the Bull” Reno embarrassed us all with her other worldly looks and actions in the name of the American people as another “hero” at Justice. Let me cut to the chase. Some in America are quietly and to a very minor degree working to bring sanity back to our local, state and federal governments. It will not be enough and it will not turn the tide. I respect them for trying and know that many have believed they could effect real change (not the Obama type). Others have written off the government and agency goons at all levels and are gearing up for some monumental change. You know, the kind of change that will have authorities buying all the Depends they can find for the day of reckoning with American citizens. I am afraid that the time has arrived for Americans to decide that the robbery of their nation can no longer be tolerated. To cede one more inch of freedom’s last acre is 50 million acres too much. To allow the enslavement of our children by a government pretending to be our benefactor is a crime that must be avenged. That is why we are in the field with you. We will do our best to help you get through this national nightmare. All we ask is that you stand with us in prayer and roll up your sleeves. It’s time to till the soil. by Former Kansas State Trooper, Greg Evensen, Ret.